There has been a rise in the number of landlords expanding their rental property portfolios over the last three months, according to fresh research by the Association of Residential Letting Agents (ARLA). ARLA questioned its members to find out if landlords are currently increasing their investment in rental properties in the private rental sector (PRS) and they discovered that the number of landlords buying properties has risen from 30% to 39% over the last three months. ARLA have taken the responses from their members to indicate greater confidence in the UK private rented sector and that rental property is still perceived as a safe investment amidst ongoing global and national financial instability by landlords with existing rental property portfolios. ARLA research also revealed that fewer landlords are quitting the UK private rental sector and selling their rental properties too, with numbers incrementally down on the previous quarter, from 15% to 14%. An institutional investor has become one of the first to buy a major portfolio of private rented housing from a social landlord in a £125 million sale and leaseback deal.M&G Investments has bought 401 market rent homes in the Stratford Halo development on the edge of the Olympic Park from Genesis Housing Association in a 35-year deal. The deal is the first residential investment made by M&G from its £1.5 billion secured property income fund. It is also believed to be the biggest single investment of its kind in the private rented sector. Castledene Property Management was awarded as Silver in the Northern Medium Letting Agent category at The Lettings Agency of the Year Awards 2012 in association with The Sunday Times and The Times and sponsored by Zoopla.co.uk. On Friday 25th May, over 450 leading lettings agents from throughout the UK attended a glittering ceremony at The Lancaster London Hotel opposite Hyde Park where the winners of only dedicated awards for the lettings agency industry were revealed. The winners received their awards from former Olympic Champion, Sir Matthew Pinsent who wowed the audience with some incredible stories of his achievements. The awards ceremony was the culminating event of a rigorous and thorough judging process carried out over a four-month period by a panel of industry experts who assessed initial entry submissions before conducting an extensive review of the entrants, which included hundreds of telephone interviews and mystery shopping exercises. The whole of the judging process was overseen by The Property Ombudsman; Christopher Hamer. The main awards were sponsored by Zoopla.co.uk, whilst the specialist categories were sponsored by some of the industry’s leading suppliers including Audio Agent, ARPM, BriefYourMarket.com, Endsleigh Insurance, Imfuna, LetMC, MidWest Displays, Moneypenny, Ravensworth, Reapit Spark Energy and The Property Academy. Looking for a dynamic, forward thinking, customer focused Property Management Company? 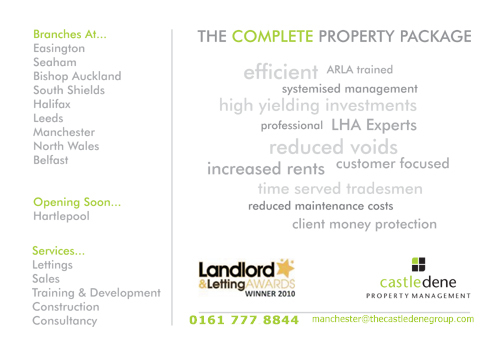 Fed up with having to manage your existing letting agent? 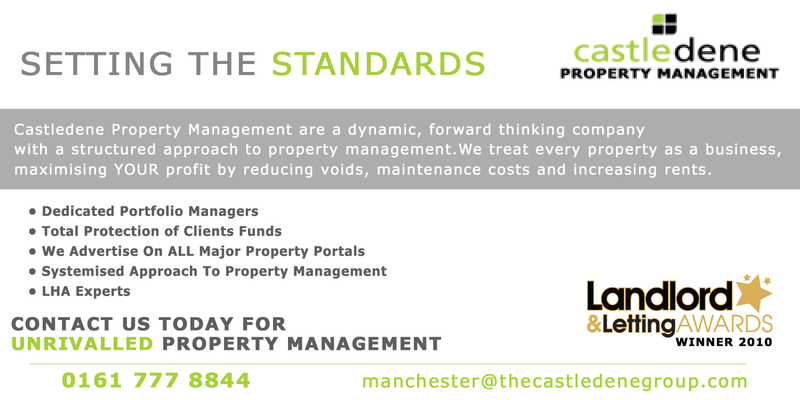 Castledene Property Management offer an award winning structured and systemised approach to property management, treating every property as an individual business, maximising profits for landlords by reducing voids, maintenance costs and increasing rents. 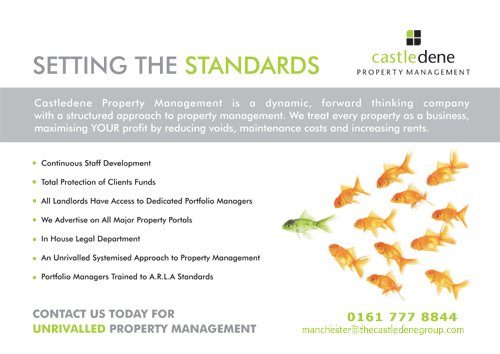 Castledene Property Management are proud of their award winning customer focused services and invest heavily in staff training and development so that they can offer UNRIVALLED Property Management. The UK Health and Safety Executive (HSE) has issued new guidance for landlords and letting agents to control the threat of legionnaire’s disease to tenants. The HSE want landlords or their managing agents, to carry out risk assessments for legionnaire’s disease, and if necessary, take action. The revised Approved Code of Practice: “Legionnaires’ disease: The control of legionella bacteria in water systems,” underlines the legal requirements for landlords and managing agents to ensure that the potential risk to tenants from exposure to the legionella bacteria from all water systems in UK PRS residential rental properties is controlled. The new guidance insists that landlords and property management / lettings agents must carry out risk assessments to identify and assess potential sources of exposure, and steps take to prevent or control any risk that is identified and record details on all aspects of their risk assessment controls, keeping records for at least five years. Landlords and property managing agents need to be aware that the legionella bacteria can thrive and multiply in hot or cold water systems and storage tanks, and be spread throughout the property by showers and taps. In water temperatures between 20C and 45C. Steps taken to control the threat of legionnaire’s disease include disinfecting the system, ensuring water cannot stagnate anywhere, insulating all pipework, and keeping water tanks and cisterns free of debris and covered at all times. Tenants should also be advised about potential risks and told to take precautions such as flushing through showers they rarely use. Anyone with concerns can contact their local Health and Safety Executive (HSE) office or Local Authority Environmental Health Department. The results of a recent survey show that due to misconceptions over Government Welfare Reforms increasing numbers of private rental sector landlords are now refusing to even consider applicants claiming Local Housing Allowance (LHA), when searching for new tenants. 47% refused to even consider LHA tenants because of the potential payment problems. This shows a real lack of understanding from UK landlords as many LHA claimants are often far more reliable than employed tenants, and all the media hype surrounding the Government’s welfare reform package has a lot to do with it. LHA tenants generally remain in a rental property long term as they view the property as a home rather than just a place to live. LHA tenants also care for the rental property as if it was their own. The rental income from LHA tenants can still be significantly higher than from employed tenants. Contrary to popular belief, Landlords can still get direct payments from local authorities. Legal 4 Landlords recommend that UK landlords should always conduct thorough tenant referencing and always take out Rent Guarantee insurance for their tenants as a back-up in case there are problems with rent payments or delayed LHA claims in the future. It is widely thought that anyone with an interest in property and business can set up a property management company or a lettings agency. But, are there pitfalls in the process for new letting agents? Over the last few years, the UK media have run countless news stories about letting agents failing their landlord clients and closing down, taking hundreds of thousands of pounds of client funds with them. Many landlord investors seem to think that all lettings agents in the UK are equal, but is this the case? Does it take a certain kind of person to make a property lettings business successful? Sales driven – you need to sell your services to prospective landlords and tenants to generate business. Unless the business is in the fortunate position of being able to employ staff, with the relevant skill sets needed, from day one, then you as the business owner will need to be master of all of the above skills, or at least be competent, otherwise you will lose business as a result of your failings. When starting any type of new business, you need to know what the main aims and objectives of the venture are and what niche will it operate in. If you don’t, how can you expect to be able to push the business forward and in the right direction? There are already thousands of UK letting agents managing Billions of pounds (GBP) worth of property out there, so what separates you from them? Why should landlords and property investors choose your letting agency instead of anyone else’s? Are you a HMO specialist, do you manage top end properties? Do you deal with LHA tenants? New letting agents often spring up and disappear again within 6-12 months because the business owners did not know enough about the local property market, the lettings industry in general, the niche market of the area they were operating in or even the demographic of their client base, in other words they did not have enough forethought to be able to survive and profit. If information and responsibility is not handled correctly, it can be a very steep and expensive learning curve for a new property lettings business, leading to a host of financial and legal issues that interfere with your client’s expectations and obligations. Such matters could also force the closure of the business, costing your landlord clients dearly. Landlords with an ill advised or ill equipped letting agency, who have been forced to close because they failed to move with the times, can find themselves with no tenancy agreements, (AST), no gas certificates (CP12), no rental income, no deposit and no fallback plan. In fact, in some cases reported by the media, some failing letting agents had stopped paying rents to Landlord clients several months prior to closing, meaning that the landlords ended up falling foul of the law and many thousands of pounds out of pocket. To be successful in property lettings, as with any business, you have to have knowledge and experience, not only the practical side of property management but also on the legal side, and keeping up with the latest government legislation, including all welfare reform changes and their impact on landlord clients, can be a minefield at times, but knowledge is power and only the strongest survive. In business, failure to plan is planning to fail and monetising your skills and knowledge is not a crime. Knowledge and experience are the keys to success so business owners need to realise where their knowledge is lacking and plug the gaps with employees or other members of a support network, such as solicitors, insurance brokers, mortgage advisor, builders etc. Letting agents can also get help is by joining the National Approves Letting Scheme (NALS) and/or the Association of Residential Letting Agents (ARLA). If you have property for rent anywhere in the North of England or Wales contact Castledene Property Management Head Office on 0191 527 4000 who will be more than happy to help!